When we realized that Mom had dementia, almost ten years ago, I automatically started looking for signs of it in myself. I thought about it every time I lost my keys or couldn’t remember someone’s name. I kept thinking, Alzheimer’s is hereditary; my mom has it, her mom had it; this is going to happen to me. One morning, I started the coffee maker, did my yoga, went back to the kitchen and poured my coffee, added milk and sugar, turned off the coffee maker, put the cup on the dining room table, went to the bathroom, got dressed, then went back to the kitchen to see if the coffee was ready. The pot was empty. What the heck? Did I forget to turn it on? I turned it on. Nothing happened. Hmm. Did I forget to put in the water? I reached for the pot to fill it; it was still warm. Wait a minute . . . I went on a reconnaissance tour. Sure enough, the cup of coffee I had no memory of pouring was sitting on the dining room table, with the spoon still in it. Moments like that were scary, especially in the early days. I was grieving the mother I had known for nearly fifty years, adjusting to her diagnosis, and learning the new skills of caregiving, all while trying to raise a teenager and somehow keep a hand in my career. I’d like to say I was ready and willing to rise to the occasion, but the truth is, I wasn’t ready. Some days I wasn’t even willing. I could see years of adult freedom disappearing before my eyes; just as my child was getting ready to leave the nest, Mom was moving to an assisted living facility five minutes from my house. Only twenty-odd years earlier, Mom had moved her mother to a nursing home and begun her daily odyssey of elder care (after years of weekly visits and endless phone calls about lost purses and stolen wallets). What if the cycle was starting again? Dementia scared me, but the thought of one day having it myself, and putting my child through what I was going through . . . that was terrifying. Thank goodness that phase passed, somehow. Humor helped. When someone at our house was forgetful, we’d say, “Dementia is contagious!” and laugh. It took the sting out, released the tension, allowed us to breathe. Pretty soon I learned that my forgetfulness was perfectly natural, given my age and how much I was juggling. I heard someone say in a support group that dementia isn’t losing your keys, it’s finding your keys and not knowing what they’re for. That’s an exaggeration, but it makes a point: simple forgetfulness isn’t the same thing as real cognitive change. Eventually I let go of worrying about my own potential dementia and concentrated on Mom. Which, as you probably know, was scary enough. What if she fell while we were out together? What if she “wandered off”? She treated everyone as her new best friend; what if someone took advantage of her? Which medications would help her, and which were potentially dangerous? Had we found the right assisted living? Was she getting the care she needed? I stayed calm on the surface, but underneath, I was scared to death. What if I screwed up? Perfectionist that I was, I was afraid of letting my mother down, along with everyone who cared about her – her friends, my siblings, everyone. When I made a mistake or lost my temper, an inner voice scolded me for failing, doing it wrong, being a bad daughter when it mattered most. I worried that I was a terrible person just for being scared and indulging in all the other feelings I had about Mom’s dementia – anger, shame, frustration. How could I let myself feel those things, when Mom was the one with the disease, the one who was really “suffering”? I can only write about this now because, like the first wave of fear, it passed. I don’t know exactly how; at some point I probably realized that Mom wasn’t dead yet and neither was I, so I might as well relax. Even while I was caught up in the fear, I had good days — even good weeks and months — as I got to know Mom-with-Dementia. I discovered she wasn’t so fragile. She could actually be generous and funny. I’ve written a lot of blog posts about that journey, about the happy discoveries I’ve made along the way, about the urgent need for all of us, our whole culture, to stop being afraid of people with dementia and start relating to them as human beings with plenty to offer the world. But the fear was real, and I would be lying if I didn’t acknowledge it. Now, I want to go back and write the other parts of my dementia care journey, the things that were harder to talk about while they were happening. I have a feeling I’m not the only one who harbors emotions they’re not proud of, and maybe, if I out myself, I can help someone else feel less alone. So that’s my mission. I’m here to say it’s okay to be scared. It’s okay to be angry. It’s okay to feel your feelings, whatever they are. We who love people with dementia don’t have to pretend it isn’t hard sometimes; of course it is. Heck, sometimes it’s hard for me to love my cat, much less my mom. And that’s okay. We don’t have to dwell in the negative feelings. We don’t have to let them run our lives. But we are absolutely allowed to feel them. Would you want to let this woman down? I have a new project for the blog, and I’m putting it out here for your consideration. I don’t usually like to promise I’ll write on any particular topic; the one time I tried that, the topic petered off after a few posts, and I went back to writing whatever was on my mind at the time. This is the same experiment, version 2.0, so it may or may not work out, but I’m going to give it a try. For the past two Septembers I have been invited to speak at the Due West United Methodist Church Caregivers Conference in Marietta, Georgia, an event organized by the extraordinary Sheila Welch. Sheila runs the church’s Caregivers’ Ministry and puts together a free, one-day conference every fall for church members and anyone from the community who’d like to attend. It’s a remarkable event, with speakers from the local and national dementia community, and I’m honored to be part of it. The first year, I gave a talk on how my work in the theatre prepared me for caregiving. Year two, I did a rather hastily prepared talk called Playful Caregiving, about the value of games and play in a dementia relationship; that’s one I’d love to develop further at some point. This year, I’m planning to talk about the emotional side of caregiving – the roller coaster of feelings, positive and negative, that come up as we travel this path with our loved ones. I think about this a lot and plan bits and pieces of the speech while I’m driving or working in the yard, but it’s hard to make myself sit down and write about it. I thought maybe if I committed to writing blog posts about each emotion, I could get feedback from readers and keep myself on task. So that’s the plan. I’d like to toss down some first (okay, maybe second or third) drafts of ideas for the conference here in the blog. (I can never publish a first draft of anything; my internal editor always wants to go over the copy.) If something I write speaks to you, or if you have an idea you think I should address, please let me know in the comments. 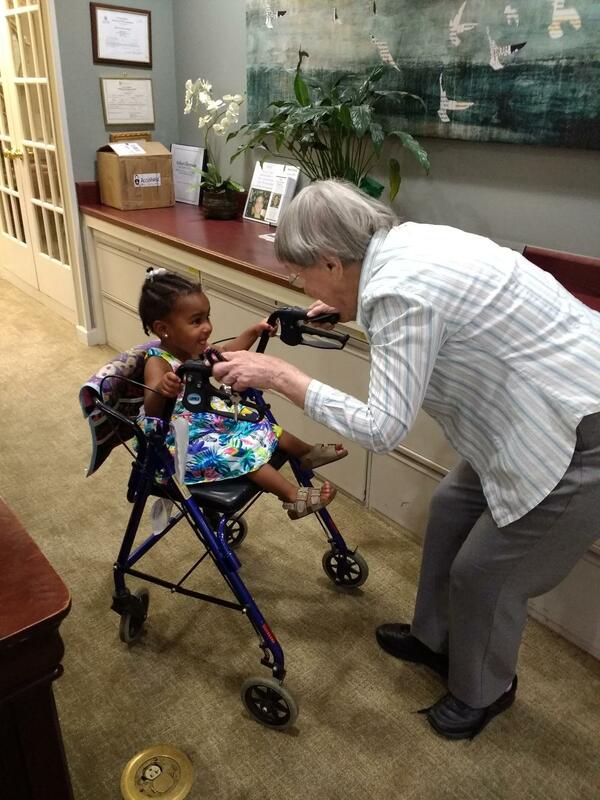 Meanwhile, here’s a picture of Mom entertaining a visitor at her assisted living. Emotion: Joy. Question: Who’s having more fun? I’m afraid I don’t have anything useful to say. Before you tell me I’m a silly girl and of course everyone wants to hear my story in Show-and-Tell, let me explain. I’ve written a good bit about my mother’s dementia in this blog, and I’d like to think I’m helping foster a better understanding of what dementia is and isn’t. I want to see myself as an activist-crusader for person-centered care, or an innovative care partner with new ideas to help make the world safe for people with dementia. I’ve even spoken at caregiving conferences, and I’m planning to do that again in September. Topping the list of people whose writing I admire is Dr. Elaine Eshbaugh, a gerontology professor at the University of Northern Iowa whose blog, Welcome to Dementialand, is the first resource I would recommend to anyone, anywhere, who might at any time interact with dementia. In fact, I authorize you to stop reading this blog right now and head over to Elaine’s. Go ahead. You won’t be sorry. I can write about my feelings, my observations, my personal experience of my own mother’s dementia. Though there are symptoms and behaviors that nearly everyone with dementia shares, I’ve come to understand that the way they play out varies from person to person, depending on their circumstances and relationships. 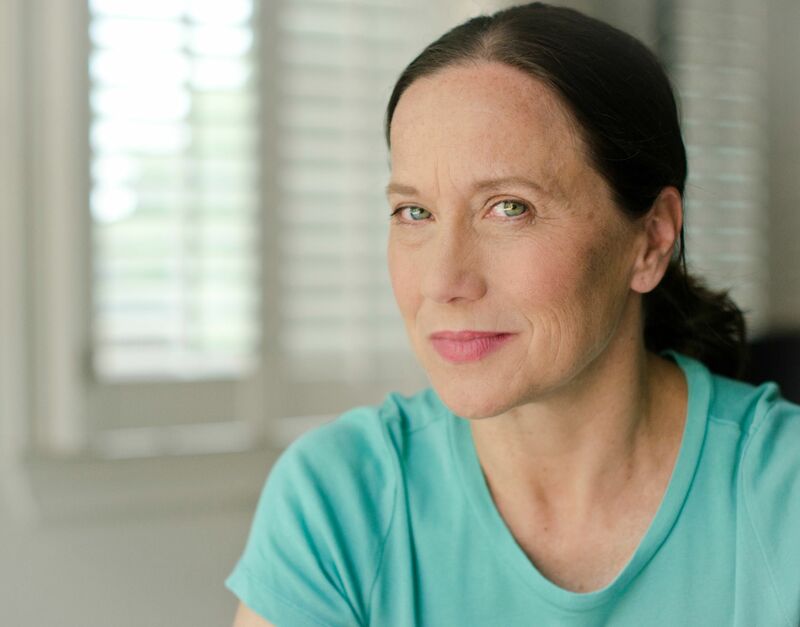 All I can chronicle here is my own path, including the specific conditions of my daily life: a career in the arts, a marriage to my junior-high-school sweetheart, a 21-year-old offspring, a house in the suburbs, a cat, and a mother in assisted living. I’m not a professional caregiver, working a stressful job in an understaffed nursing home; I’m not a harried working parent whose mother-in-law just moved into the guest bedroom; I’m not a gerontology professor. I don’t have dementia myself. Other people can speak eloquently about those situations. I can’t. Sometimes I can’t even talk about dementia; I need to walk away from it and pretend it doesn’t exist. However much I’d like to change the landscape of dementia care, I don’t think I’m cut out to be an activist-crusader. Dementia has made its presence known in my life, and I’m dealing with it. I can share that. If dementia has shown up in your life, I can witness to the truth that you’re not alone. If it hasn’t, I can gently remind you that it probably will someday, and that when it does, you’re going to be humbled by it. And that’s okay. Humility is a good thing. It’s one of dementia’s gifts, delivered periodically like a fresh bouquet of flowers, reminding us not to take life so seriously. We can’t all be experts. Let’s just be ourselves, shall we? P. S. I really meant it — you should check out Elaine’s blog! I don’t know her, I don’t get any money from her, I just think she’s great. Here’s a post to get you started: Tips on Communicating in Dementialand. Tell me what you think! Unless someone in your family is living with dementia, in which case, can I pour you a drink? Or perhaps chocolate is your drug of choice. Then let’s belly up to the chocolate bar and drown our sorrows in cocoa and whipped cream. Either way, we need to admit that this is hard. I’ve been absent from this blog for a while, partly from an abundance of wonderful creative work, and partly from uncertainty about what to share. Mom’s dementia is advancing, and I don’t know which stories to tell, especially at Christmas. Or I can acknowledge the grief, the dull persistent ache, of realizing that she’s getting more confused, that the disease is gradually taking her in the same direction it took my grandmother — to a place of paranoia and isolation. That route saddens me so much that I quietly avoid it. I work around it. I find ways to redirect her attention to things that make us both happy: songs, games, friends, church, simple sewing projects, nature. And I ask myself, am I really handling her dementia well, or just pretending it isn’t there? As always, I suppose the truth is somewhere in the middle. It’s true that this is the hardest time of year for her, and by extension, for me. She genuinely believes that her gifts have been stolen. She needs to be reassured, over and over, that they’re all at my house, safely wrapped and ready for Christmas day. (Leaving them at her place just confuses her.) Next week she’ll say that all the gifts she received have been stolen, and take bitter, self-righteous comfort in the belief that at least, like a good little girl, she wrote her thank-you notes. That’s how it goes, every year now. I hate it. Yet somehow this year, I’m doing okay. I’ve learned not to draw too much attention to Christmas. We don’t decorate her apartment anymore, because the ornaments trigger her paranoia. We do a little shopping with her and take care of the rest on our own. We visit thrift stores all year round; her favorite thing to do is to buy me “something pretty,” and she never remembers what we’ve bought. This means I can pull out a sweater she bought me weeks ago, and put it under the tree as her gift to me. She won’t know the difference. That’s sad, but somehow freeing. One more step on the path to letting go. And it’s true that, in this season of high expectations, this season of “Joy to the World,” I sometimes lose sight of the beauty in my little corner. But it’s there. Last Sunday we took Mom out to lunch after church. She tasted her vegetables and immediately reached for the salt shaker. She took a few bites, reached for the shaker, and salted again. And again. And again. It’s a dementia thing; her sense of taste is changing. The fourth or fifth time, I gently but firmly urged Mom not to salt her food. I told her I was sorry to be bossy, but she’d already done it twice (no need to mention the other three times), and we needed to watch her sodium. I noticed a woman at the next table looking at me with a concerned expression. I wondered if she thought I was being cruel; why shouldn’t my mother salt her food as much as she wanted? I wondered if I was being judged. As we were leaving the restaurant, the woman caught my eye and whispered, “Bless you.” I stopped to make sure I’d heard her right. And there it was. The beauty. The sense of connection. The surprising knowledge that even when I feel most alone, a stranger understands. Greetings of the Season. Season’s Greetings. As I write this, it’s Sunday morning here in metro Atlanta. I’m still in my pajamas, but pretty soon I’ll have to get up from the computer, pull some clean clothes out of the dryer, turn on the iron, and get ready to take Mom to church. Church has been a source of comfort and gratitude for me since Mom developed dementia. I grew up in the Episcopal Church. Literally — I was born while my dad was studying to become a priest, and spent my childhood attending weddings, funerals, and every kind of service in between. Mom was as devoted an Episcopalian as Dad, maybe more so. When she moved to Atlanta, she left a thriving church community behind, so it was vital that we find her a religious home. She settled with me at Church of the Epiphany, a quirky, liberal Episcopal outpost between Atlanta and Decatur. One of the things I love about my church is that no-one there expects me to have this God thing figured out. Church is a place where I can take my doubts, my fears, my frustrations, and my cognitively confused mother, and feel like part of a community. Mom knows the services by heart. She can still find the pages in the hymnal, and she loves to sing (off-key, but that has always been part of her charm). She is enchanted by all the children who come to the altar for communion. We have communion every Sunday, and children are welcome long before they understand the meaning of the sacrament. Which is a good thing, because I’m 55 and I don’t fully understand it myself. I don’t actually understand much about the faith of my childhood, which has become, by default, the faith of my adulthood. It’s more a religious practice for me, a showing-up-and-going-through-the-motions that somehow connects me with something larger than myself (even if it’s only the community of other people going through the motions with me). 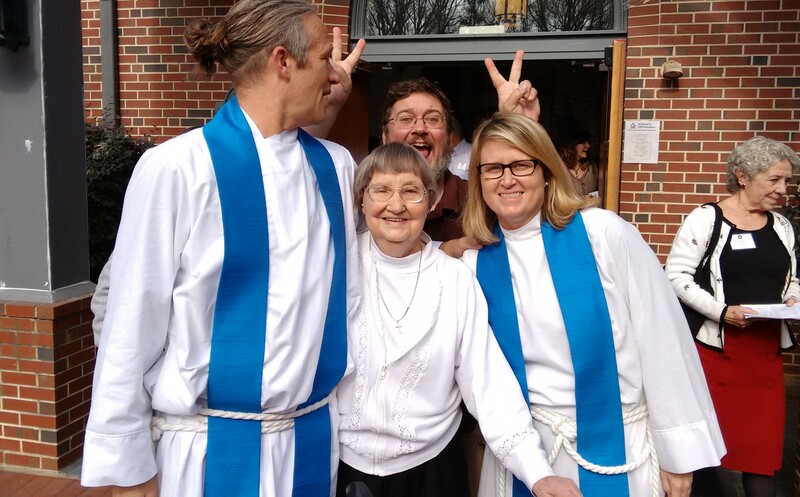 But I do know this: my quirky, eccentric church community has embraced my mother. They have made her life more meaningful than it ever could have been without them. They love her unconditionally. When we pause in the midst of every service to greet each other, they line up to hug her. That makes my life as a caregiver sweeter than my church friends can imagine. Some of them probably think I’m brave and saintly to bring my poor elderly mother to services. Well, guess what: I may be a little brave, but I’m no saint. I don’t want to get out of my pajamas, this Sunday or any Sunday. If it weren’t for Mom, I’d probably skip church. Heck, last week we went to the Church of Waffle House. But I’m going today, and again next Sunday and the Sunday after, if I can get my lazy self out of bed. Because at church, Mom knows where she is, what she’s doing and why she’s doing it. She knows that she is loved, and she has an outlet for all the love she wants to give other people. She may be deaf; she may not be able to hear the sermon or understand the announcements. But she’s part of a community and a tradition that existed long before her birth and will continue long after her death. She’s an Episcopalian. She’s a child of God. And that is enough.